Chazuke is a light rice dish popular in Japan. As "cha" means tea in Japanese, hot green tea is simply poured over steamed rice and various toppings. Leftover steamed rice is often used for this dish. This is my dog friendly version which can easily be shared with the humans. Kirby loves fish but you can use any shredded cooked meat such as chicken or turkey. Green tea is a calming tea rich in anti-oxidants and has been found to be helpful in fighting some cancers. Brown rice has too much of a nutty flavor and chewiness for this dish so I use parboiled rice or white rice that has been pre-soaked. I use carrot baby food all the time since Kirby doesn't like carrots and will eat around them. You can easily shred a few small carrots in place of the baby food. Dried kelp can be found at any Asian market or ordered online. *Choose natural baby food containing only carrots and water. Steep three cups of tea. Remember to choose decaffeinated as caffeine is toxic for dogs. Cook the rice according to package directions but substitute the water with two cups of the brewed green tea. Add the ginger and sea salt before bringing the rice to a boil. Meanwhile cook the kelp by bringing a small pot of water to a boil and then simmering for 20 minutes. Drain and chop into small pieces. Remove the cooked rice to a large bowl and stir the third cup of green tea, salmon, baby food, and optional kelp until thoroughly mixed. This can be kept in the refrigerator for up to five days and in the freezer for several months. 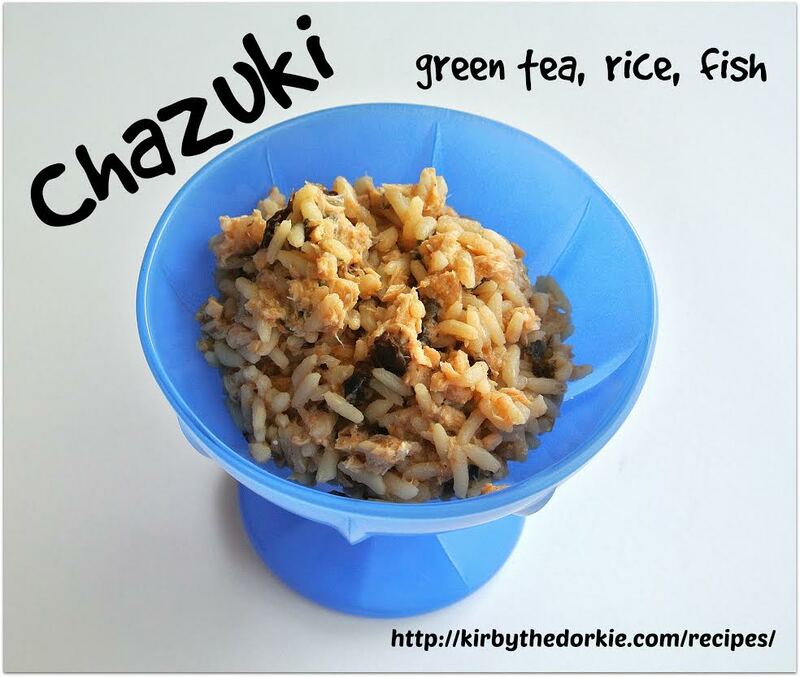 What do you think of this Oriental-inspired meal for dogs? Let us know in the comments!